This Easy Eggless Tiramisu is a take on Italian classic and would make perfect dessert for any special occasion! Layers of coffee soaked biscuits & wonderful mascarpone cream with coffee liqueur – make-ahead and no-bake dessert heaven! Perfect make-ahead (no-bake) dessert for special occasions! I love Tiramisu! 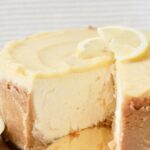 It is definitely on the list of my favourite, easy, no-bake desserts. It also happens to be one of my hubby’s favourite so I tend to make it as a special treat for him or as a bribe when I want for something to get done lol. 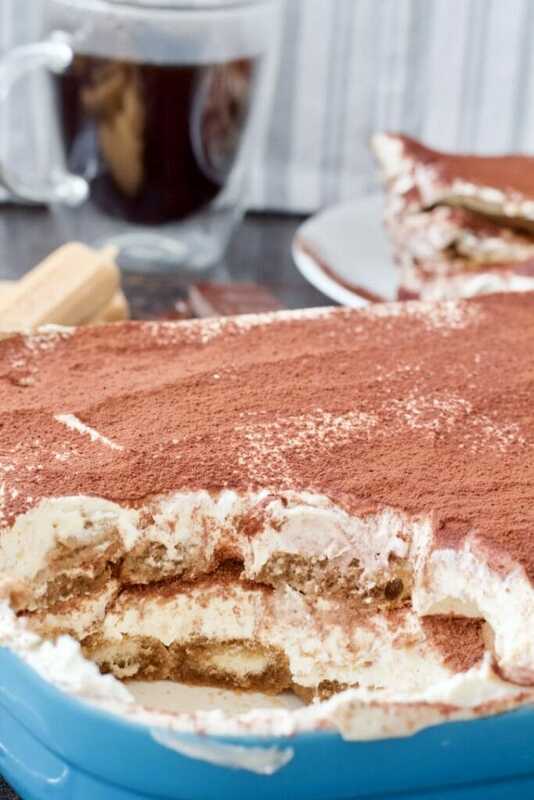 Even though occasion isn’t important here at all as this Easy Eggless Tiramisu definitely doesn’t need one, it is perfect for when you want to make a great impression. 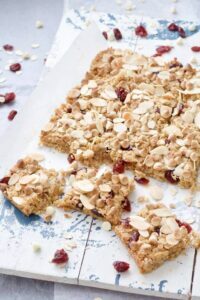 It’s a fantastic choice as a Valentine’s Day or dinner party dessert! The best thing about this dessert is that it can be prepared in advance and without too much fuss. It really is a super easy, no-bake dessert and the perfect one for making ahead too. 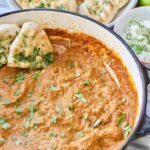 It is the best after a good chill in the fridge, preferably overnight, (although if you are short on time couple of hours will do too)! 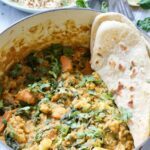 Once made it will keep well chilled in the fridge for up to 4 days so you can really get ahead here. 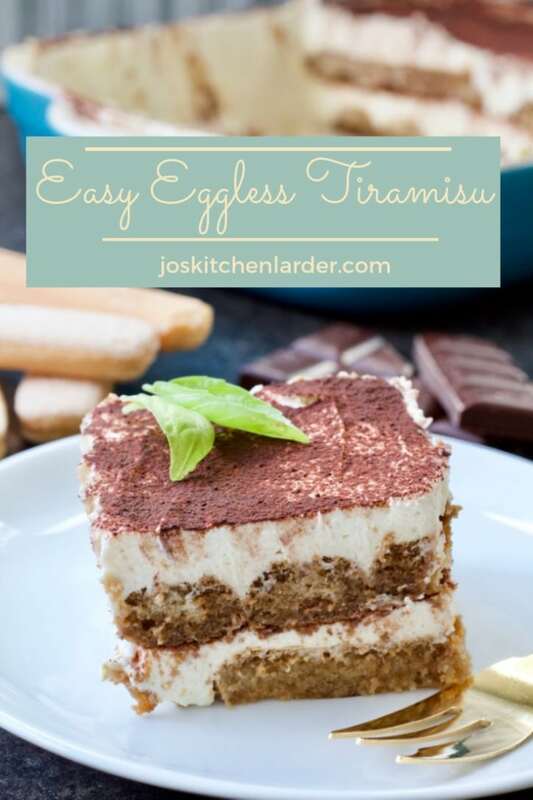 Few tips on how to make this Easy Eggless Tiramisu a success! 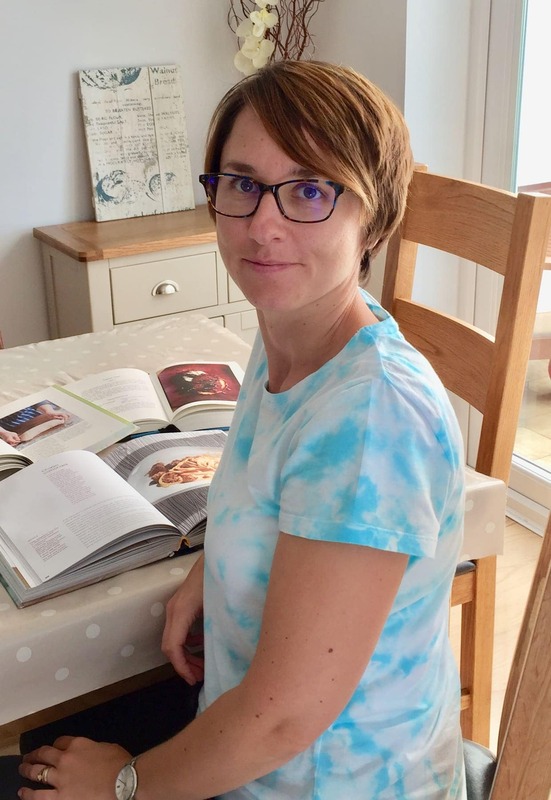 This particular Tiramisu is based on the recipe I have seen in BBC Good Food Magazine quite a few years back and which I have since modified to my liking. I have made it a bit lighter just to make myself feel a bit better when eating it and also changed the alcohol used from original Marsala to Baileys. Feel free to use any other coffee liqueur or indeed go back to Marsala. I do, however, find Baileys simply perfect here. I don’t know about you but I like biscuits in my Tiramisu really well soaked in coffee. The amount of coffee for well soaked biscuits is 300ml (1 1/4 cup) and I never have any left. To make things slightly easier on yourself divide your biscuits and coffee in half and make sure you use 150ml (10 Tbsp) of coffee for each 100g (3.5 oz) of biscuits. Oh and a word of warning here! 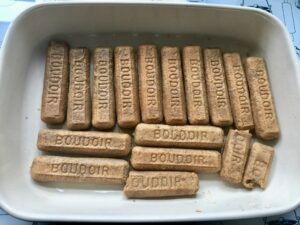 Unless you are really strong willed, you will most likely end up with couple of lady fingers biccies (pre-soak) in your belly which is (of course) allowed (even encouraged) lol. Perks of the cook, they say! 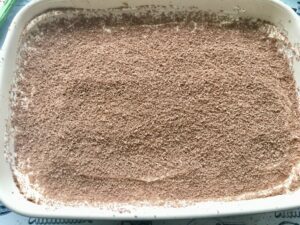 I like to make my tiramisu in one large dish (approx. 24 x 18cm/9.5 x 7 inch) however you might prefer individual portions. These look best in nice tumbler or perhaps sundae style glasses where you can see all the layers. 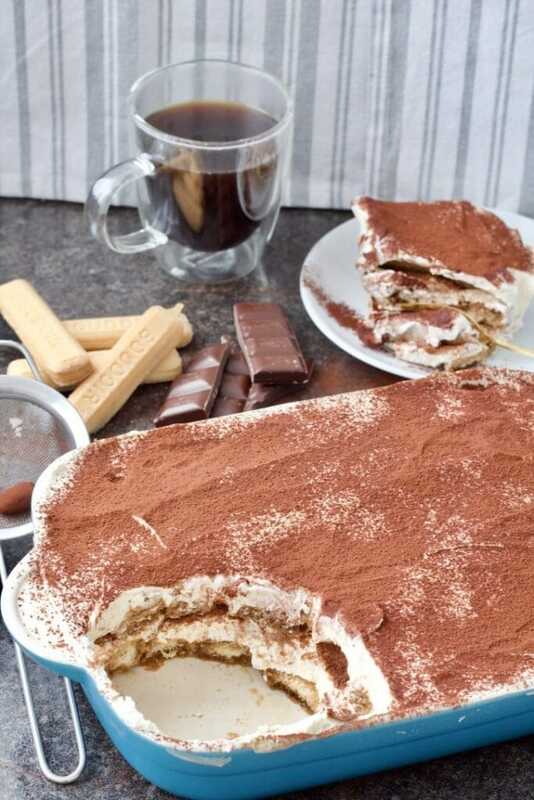 Most of the time one dish tiramisu is much easier and quicker though, and if you put your mind to it when serving up, you can get great looking, neat squares that will impress. How can I adapt this dessert? Use any coffee liqueur you’ve got handy or like the most. 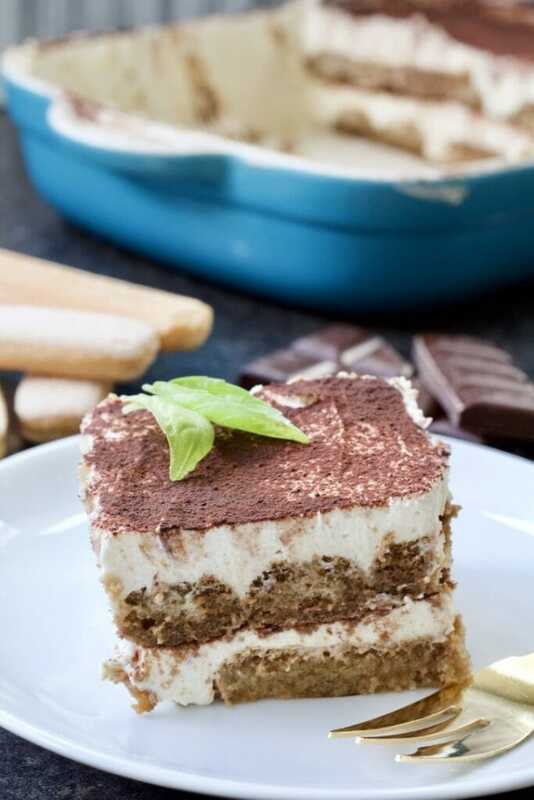 If you’d like to make this Easy Eggless Tiramisu without any alcohol, simply leave it out. There is no need to substitute it with anything but you could add same amount of coffee in place of liqueur if you wish. Use espresso or strong filtered coffee instead of instant. If you don’t have any creme fraiche simply increase the amount of double cream to 500ml/2 cups. If you’d like 100% egg-free dessert you could substitute lady fingers for egg-free sponge cake. I would suggest to leave it out to dry a bit before gently spooning coffee over it. The fact that this dessert is eggless wasn’t too intentional at first and it definitely isn’t authentic, however I do prefer it to the eggy version and don’t think I would venture into the raw eggs territory in dessert now (I’m slightly paranoid). Please note, however, that this recipe still contains some eggs in the lady fingers sponge biscuits so it isn’t 100% egg-free if you are allergic to eggs. Can you freeze Easy Eggless Tiramisu? I must say I have never tried freezing it but after a bit of research I found that it is indeed possible. 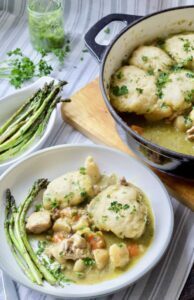 However, it is advised to use full-fat ingredients if you are thinking of freezing it (source – Nigella.com). To freeze it, wrap it tightly in couple of layers of clingfilm followed by aluminium foil and freeze for up to 3 months. Defrost in the fridge overnight. If you were planning on freezing your Tiramisu, I wouldn’t dust the top with cocoa powder until it’s defrosted for that freshly made look. If you have ever frozen this dessert, please let me know. This Easy Eggless Tiramisu is a take on Italian classic and would make perfect dessert for any special occasion! 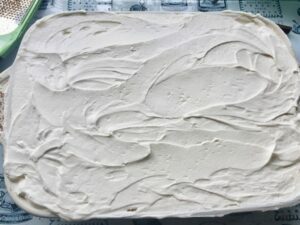 Layers of coffee soaked biscuits & wonderful mascarpone cream with coffee liqueur - make-ahead and no-bake dessert heaven! Start by preparing coffee. Set aside and let it cool slightly. While coffee is cooling prepare mascarpone cream mixture. In a large bowl or in a bowl of your standing mixer put mascarpone, double cream, creme fraiche, sugar and Baileys. Mix together with your hand mixer or balloon attachment of your standing mixer until you get the consistency of thick whipped cream. Take care not to overbeat. Once your coffee has cooled slightly divide biscuits in half and dip them in it one by one. Let them "drink" the coffee a bit. You should use approx. 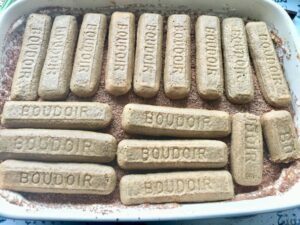 150ml / 10 Tbsp for each half of biscuits. Layer the biscuits at the bottom of the dish as you dip them in the coffee. If after dipping your biscuits you still have some coffee leftover (you used less than 150ml / 10 Tbsp) I would suggest to pour it gently over the biscuits using the spoon. Spread half the mascarpone mixture on top of the first layer of coffee soaked biscuits. Using fine microplane (or similar) grater, grate the dark chocolate squares over the mascarpone layer. 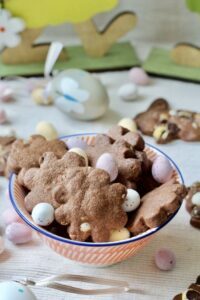 Follow with another half of lady finger biscuits soaked in coffee and another layer of mascarpone mixture. Finish with dusting of cocoa powder. Chill for at least couple of hours but preferably overnight. If you use half or low fat mascarpone cheese the calories and fat content per serving will be lower then the ones stated below. Instead of instant coffee you can also use 300ml / 1 1/4 cup espresso or strong filtered coffee. If you don't have any creme fraiche simply increase the amount of double cream to 500ml/2 cups. Feel free to use grated chocolate on top instead of dusting of cocoa if you prefer. For non-alcoholic version simply leave the coffee liqueur out. There is no need to substitute it here but you could use equal amount of coffee in place of liqueur. Tiramisu will keep in the fridge for up to 4 days. 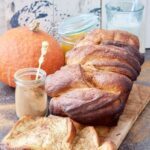 Update Notes: This post was originally published on 12 Feb 2018, but was republished with new recipe card, updated Pin, tips and other useful info in January 2019. Some other gorgeous desserts you might enjoy! 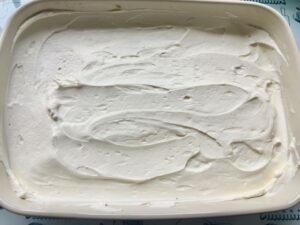 Pin Easy Eggless Tiramisu For Later! I’m not a coffee fan, but I do love homemade tiramisu as I can make it with just Baileys! Love that this is egg free too as the idea of raw egg is always off putting. Not a coffee fan???!!! Lol, only kidding! I’m so with you on the raw eggs hence the eggless version, much safer and as delicious. I’m not really a fan of coffee in desserts, but your tiramisu looks truly lush. CT on the other hand would love me forever if I made him this. Thanks for sharing with #WeShouldCocoa. 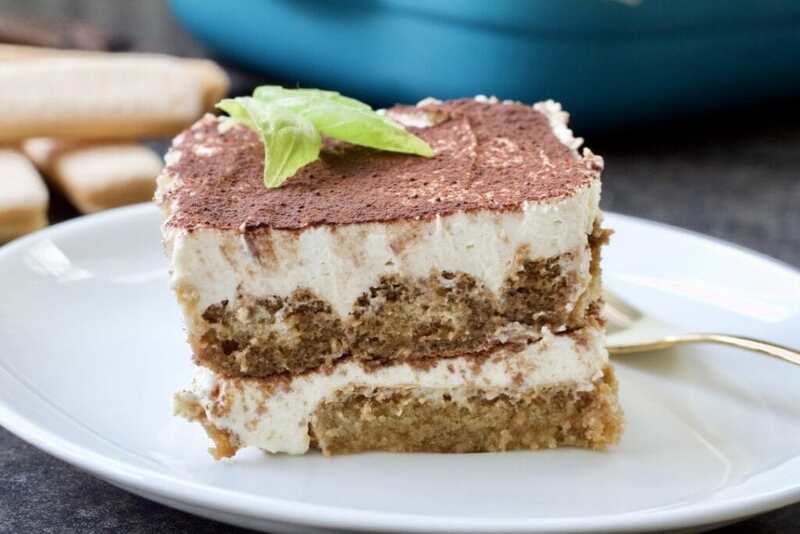 Oh tiramisu is one of my favourite desserts, I love it! This looks amazing 😍 Pinned! Fabulous Jo.Tiramisu is one of my faves too.Strong black coffee is a passion of mine!This version sounds absolutely lush! 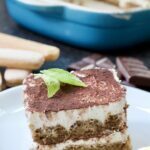 Tiramisu is one of my favorite make ahead desserts! I use to own a coffee shop and we made it in big sheet pans all the time! Yours looks amazing! Thanks Patrick! 🙂 I love the fact that it’s make ahead and actually easier and quicker to make than people think!